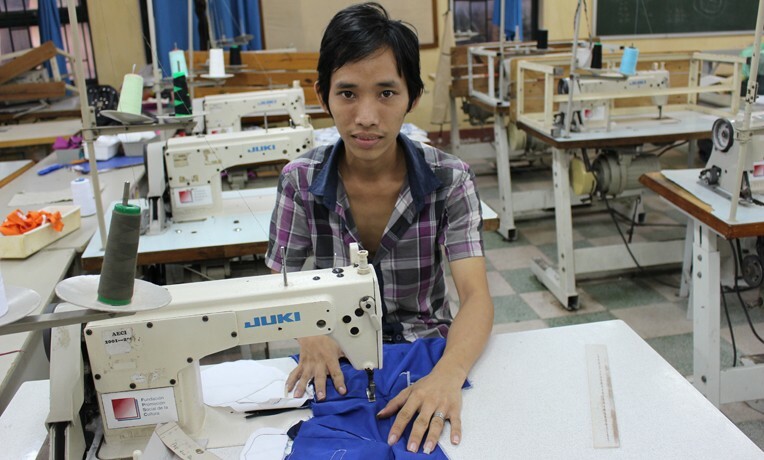 Sinh Anh is earning an income for his family through training funded by Samaritan's Purse. Before Samaritan’s Purse helped Sinh Anh attend vocational school, his creativity—expressed in drawings—merely served as a means to ease his sadness. Now, his artistic ability has been funneled into sewing, which allows him to support himself and his family. Students are learning at Hoa Sua school in Hanoi, Vietnam. him physically weaker than his peers. Often this would make him feel inferior, sadness would set in, and he would withdraw from everyone around him. This sadness was magnified when his father left. He would lose himself in his drawings. His parents had divorced and his father remarried, leaving Sinh’s mother to take care of the family by herself. Sinh loved his mother and wanted to earn money to help her and his three siblings. So despite his impairment, Sinh was determined to find a job and become independent—a tough task for a person with disabilities in Vietnam. But God would soon use Samaritan’s Purse and a well-known vocational training school to show him a successful path forward. Most people in Sinh’s village had heard of the Hoa Sua Vocational School 1,200 miles away in Hanoi. Built almost 22 years ago, Hoa Sua had helped many disadvantaged and disabled youth learn vocational skills and land long-term jobs. Sinh, though, had never thought going there could be a possibility. With financial support from Samaritan’s Purse, Sinh and more than 40 other students attended Hoa Sua last year. Sinh was hoping he’d learn how to embroider. The young artist longed to create beautiful pieces of art with colorful threads. When the embroidery class proved too difficult because of Sinh’s arm, his teachers moved him to a sewing class. Before long, Sinh knew how to sew shirts and pants. Sometimes it’s still hard for Sinh to believe he learned a skill that would help him and his family have a better future. “I’m really thankful for the support of Samaritan’s Purse, which helped reduce the financial burden of my family,” said Sinh. Samaritan’s Purse also offers life skills training for Hoa Sua students. For the first time in his life Sinh learned about responsibility, goal setting, effective communication, and self-awareness. Sinh also participates in the after-school English class sponsored by Samaritan’s Purse. He has learned that living with a disability doesn’t mean he has to be discouraged or live in self-pity. He has learned to make friends and share his feelings. He knows he is loved. 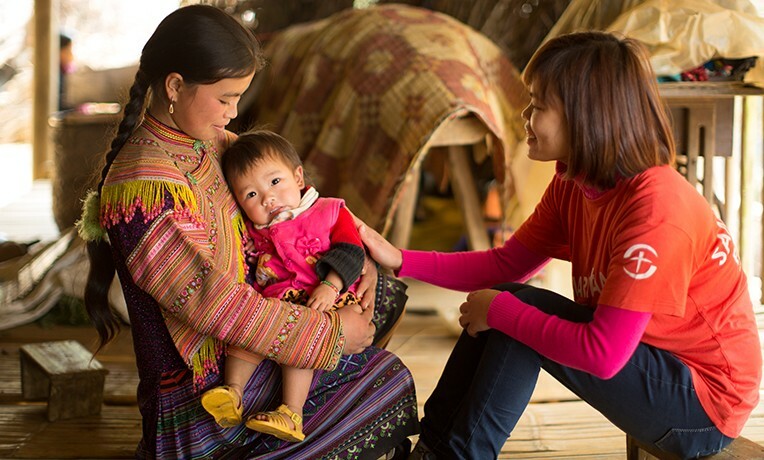 Please continue in prayer for the work of Samaritan’s Purse in Vietnam.